The Dodge City Community College Foundation is a separate 501(c)(3) tax exempt organization working to provide funding for student and college needs not otherwise covered by tuition and tax revenues. With the help of generous donors, the foundation helps students of all ages reach their dreams of careers, better jobs, or four-year degrees. The foundation’s board of directors generously volunteer their time, talent, and resources to help sponsor events that directly benefit the lives of students at DC3 while creating a spirit of community. They host a variety of events each year, including an auction and a golf tournament. Through your gifts to the foundation, you help create a chain of philanthropy that extends our culture of common goodwill into the future. By making a donation through scholarships, endowments, unrestricted gifts, bequests, or by volunteering your time, you make a profound difference for students, and for the health of our communities. Thank you for supporting DC3. Join us on LinkedIn, Facebook, and Twitter! Endowment gifts are provided by donors to generate ongoing support for Dodge City Community College students, faculty, and programs. Each endowed fund is managed and tracked separately within the foundation’s financial system. All individual endowed funds are invested as a combined pool, with each fund owning a pro-rata share of the total value and receiving a pro-rata share of the pool’s overall investment return. The purpose of this model is to grow the principal of each endowed fund and provide protection against inflation while supporting the purpose designated by the donor. The primary financial objective is to preserve and enhance the pool’s inflation-adjusted purchasing power net of all investment management cost, while providing funds for current spending. The primary long-term investment objective of the pool is to attain an average annual real total return (net of all investment related fees) in excess of total expenditures (spending and overhead expenses). This pool of assets requires a long-term view and must be managed with this view. Asset allocation plays a critical role in preserving the assets, producing a relatively stable spending stream, and allowing opportunity for growth. These goals must be balanced in setting the asset allocation. 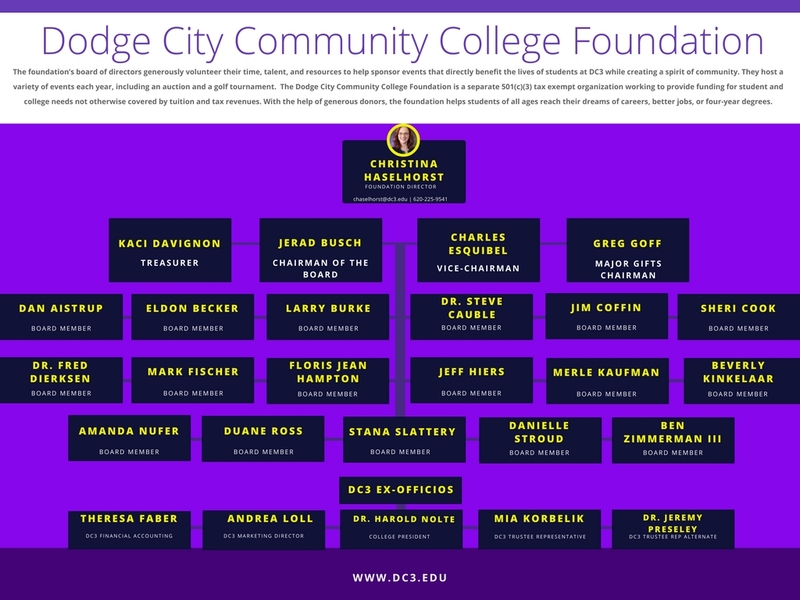 The Foundation is made up of volunteers who are donors and alumni of Dodge City Community College with investment, business, and financial experience. The Dodge City Community College Foundation’s financial statements are audited annually by the independent audit firm of Kennedy, McKee & Company LLP in accordance with auditing standards generally accepted in the United States. The independent auditors report directly to the foundation board. If you have any questions or would like a printed copy of our financial reports, contact Chris Haselhorst at chaselhorst@dc3.edu.